Amazon may come up with it’s first acquisition in India. Rumours are rife that the ecommerce giant is planning to buy Indian fashion ecommerce portal jabong.com for the price of $1.2 Billion (highest amount for acquisition in Indian ecommerce industry). After Myntra’s acquisition by Flipkart in May this year, there has been constant speculation about Amazon- Jabong deal. And, there might be another mega deal in the making – The Alibaba – Snapdeal partnership. Only time can tell if this will come to fore. 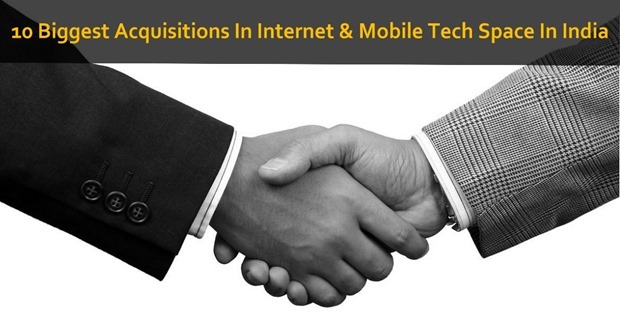 Until then, let’s find out some of the other major acquisitions that have happened in the the internet and mobile tech space in India. Flipkart- Myntra deal is technically the highest price deal in Indian ecommerce industry till date. The deal between these two Bangalore based ecommerce companies took place in May 2014. Interestingly, both of them had common investors- Tiger Global, Accel Partner and Sofina Partner. Tiger Global and Accel Partner had proposed the deal to Flipkart and Myntra a year before. The deal was sealed for a staggering $330 million! In November 2013, Japanese giant Hitachi bought 100% stakes of Prizm Payment Services, a Chennai based payment service providers for around $250 million. The deal was approved in February 2014 by The Cabinet Committee on Economic Affairs of the Government of India. Prizm is an ATM and PoS service provider company along with a technology of mobile payments. Collaborating with Mswipe Technologies, Prizm entered in mobile payment technology for hassle free services. Prizm was founded in 2007 by Loney Antony and Shyam Sunder in Chennai. In mid 2013, a joint venture of South African Naspers and Chinese giant Tencent- Ibibo group had acquired Indian ticketing platform redbus.in for estimated price of approx. $100 million. Redbus is one of the biggest online ticketing platforms. It was a product of Pilani Soft Labs founded by BITS Pilani graduates Phanindra Sama, Charan Padmaraju and Sudhakar Pasupunuri in 2006. Rebus was selling 12 million tickets a year and had 600 employees before it was acquired by Ibibo. Facebook is known for acquiring start-ups. Till August 2014, Facebook had acquired 50 companies across the globe working in different computer technologies. Facebook’s first Indian acquisition came in early 2014. They acquired Bangalore-based Little Eye Labs which is a performance analysis and monitoring tool that helps identify and fix performance problems in Android apps. Little Eye Labs was founded in 2012 by Kumar Rangarajan, Satyam Kandula and their team. It was acquired by Facebook for $15 million. In January 2014, after Facebook-Little Eye Labs deal, Google acquired its first Indian company Impermium for estimated $9 million. It was Google’s 142nd acquisition. Impermium is a cyber security company that provides anti-spam and account protection services for websites. Impermium was founded in 2010 by Vishwanath Ramarao, Naveen Jamal and Mark Risher who were previously working for Yahoo. Yahoo’s first acquisition in India came in September this year, when it acquired a Bangalore based start-up Bookpad for $15 million. Docspad is a flagship product of Bookpad. It is a cloud based document handling mobile application. Users can open, edit and use any documents without downloading them. Docspad supports Word, PowerPoint, Excel, PDF, ODX, ODT, ePub 2.0 and other image formats. Bookpad was founded by Aditya Bandi, Ashwik Reddy and Niketh Sabbineni in 2013 in Bangalore. All three of them are alumni of Indian Institute of Technology, Guwahati (IITG). Cricbuzz.com was acquired by Times Internet in November this year for an undisclosed amount. Cricbuzz is the second most viewed cricket website in the country after cricinfo.com. It is now expected to merge with gocricket.com an already existing cricket blog owned by Times Internet. Cricbuzz was founded by Pankaj Chhaparwal, Piyush Agarwal and Pravin Hegde in 2004. Currently, Cricbuzz has 5 million visitors a month. Cricbuzz is the fifth acquisition made by Times Internet this year. Before Cricbuzz, they had acquired CouponDunia, DineOut, Moneysights and MusicFellas. Bitzer, a Bangalore-based mobile management solution company, was acquired by Oracle in November 2013. Neither Oracle nor Bitzer disclosed the amount of the acquisition. Bitzer provides a mobile management solutions technology to various companies. Their technology allows employees to access their company related data on their mobile devices. It was founded by Ali Ahmed, Indus Khaitan and Naeem Zafar. Vuclip is the world’s largest independent media and mobile video company based in USA. The company has its branches in India and China. It was founded by Nickhil Jakatdar in 2008. In a span of just 5 years, the company grew to become a leader in its respective field and acquired Indian mobile video company Jigsee for an undisclosed amount in February 2013. Jigsee provides video streaming platform especially for mobile devices. It was founded by former Yahoo employee Ray Nehwal back in 2010. South African Naspers Media Groups’ company Tradus acquired Hyderabad based ecommerce portal buytheprice.com. It was owned by myZingo Ecommerce Service Private Limited. The amount of the deal is still undisclosed by both the parties. This acquisition was the Tradus’ first footstep in Indian ecommerce business. Though the amount of the deal remained undisclosed, it was considered to be a first major acquisition in Indian ecommerce market at that time. Surpirsed by the quality of research. Poor research. Err…Gluster was bought by Redhat for $150 Million USD.